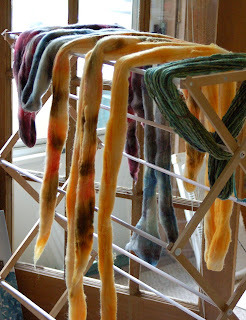 I've been playing around with some different dye combinations this week, and I've had some success so far. I hope to play around with some different techniques so none of them are too big. I got this drying rack this week, and it is nice to have for my roving -- no more moving everything out of the shower when I need to use it! 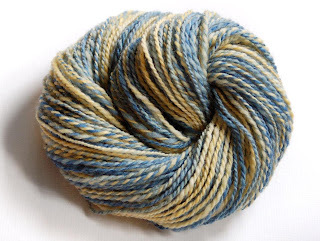 This yarn reminds me of old farmhouses, It is about 105 yards of worsted weight, and is a very strong yarn. I made two skeins of this yarn. I was playing around with making a marled yarn, and I think I was pretty successful. 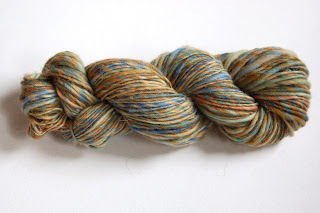 Both skeins are around 100yds and are a heavy worsted/bulky weight. I am heading to the craft store tomorrow with intentions of buying supplies for my wedding invites, I've got a good idea of what I'm doing, I just need to get going on them. I am also making good progress on my dress. I am making a mock dress in plaid, and have it mostly done. I just need to finalize a few things, and then I am set to start working with the real fabric. 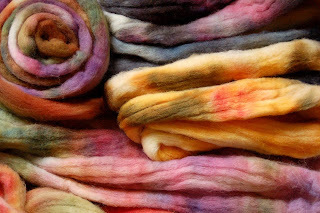 I am scared to use the nice fabric, I almost always use thrift store fabric or clearance fabric, so it is weird for me to be using such beautiful fabric. I will try to post some progress pictures later this week. :) Also, my good friend Tony is coming back from studying in England soon, and I am getting excited for that as well!